The flu vaccine not only helps reduce the risk of influenza, but it can lower the risk of heart attack and stroke. According to the study, not only could the flu vaccine protect you from the influenza virus, but it may also help you lower your risk for life-threatening cardiovascular conditions, such as heart attack and stroke. Led by Jacob A. Udell, M.D., M.P.H., F.R.C.P.C., the researchers from the University of Toronto looked at five published randomized placebo-controlled trials (RCT) and one unpublished RCT that had investigated the influenza vaccine and cardiovascular events. Their goal was to determine if the flu vaccine lowers the risk of cardiovascular conditions, such as heart attack. In total, 6,735 patients with an average age of 67 were included in the study. Fifty-one percent of these patients were women, and 36 percent of patients had a history of cardiovascular problems. From the five published studies, 95 out of 3,238 patients (2.9 percent) that received the influenza vaccine suffered from a major cardiovascular event during the one-year follow-up period. In contrast, 151 out of 3,231 patients (4.7 percent) who received a placebo or control treatment suffered from a major cardiovascular event during the one-year follow-up period. The researchers then did another analysis on a subgroup of patients who had pre-existing coronary artery disease (CAD). They found that individuals with a history of stable CAD had a reduced risk of adverse cardiovascular events if they received the influenza vaccine (6.9 percent), as opposed to the patients who received the placebo treatment (7.4 percent). Additionally, they found that the reduced risks were even more prominent in individuals with a recent history of acute coronary syndrome (ACS). These individuals had a significantly reduced risk of suffering from a major cardiovascular event – reduced to a 10.3 percent likelihood – if they had received the flu vaccine, compared to patients who received a placebo or control treatment, with a 23.1 percent likelihood of suffering from a major cardiovascular event. The results consistently showed that receiving the flu vaccine provided protection against adverse cardiovascular events, with an added benefit for those with pre-existing coronary artery disease. The researchers from the current study plan to conduct a clinical trial, which will follow heart patients for up to a year following vaccination, in an effort to determine the safety and effectiveness of the flu vaccine for heart attack and stroke prevention. According to CBC News, less than half of individuals under the age of 65 with pre-existing health conditions such as cardiovascular disease, get an annual flu shot in North America. Dr. Kathleen Neuzil from PATH’s Vaccine Access and Delivery program in Seattle reports that the influenza flu vaccine is 40-70 percent effective for middle-aged and older adults. She states that the use of the influenza flu vaccine in this population is warranted, considering that the flu virus causes illness in both those with and without pre-existing medical conditions. Public awareness of the health benefits of the flu vaccine, especially for individuals that are at a heightened risk of heart attack and other cardiovascular events, is essential. 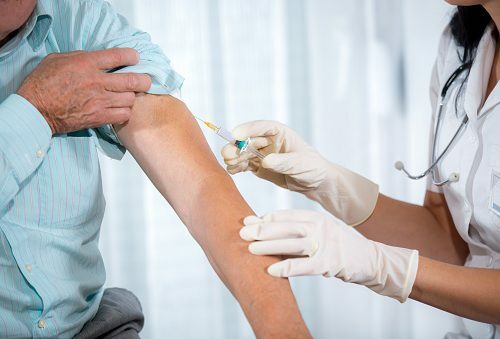 Medical practitioners should be addressing the effectiveness of the flu vaccine with their middle-aged and older patients to help them make informed decisions regarding their health. This will hopefully lead to improved influenza vaccination rates in North America.